Step 1 Place the flour in a food processor with the salt and pulse to mix. Cut the three-fourths cup plus 2 tablespoons butter into 1-inch chunks and add them to the flour. Pulse four to six times to break up the chunks of butter. Combine the vinegar and egg yolk in a measuring cup and add enough ice water to bring the volume up to one-half cup. While pulsing, add the liquid in a steady stream until the flour looks crumbly and damp. You may not use all of the liquid (we used one-fourth cup). Between 25 and 30 pulses should be enough. Don't let the dough form a ball. The crumbs should adhere when you gather them in your hand. If not, add a few more drops of ice water. Divide the dough into two parts. Wrap in plastic wrap and refrigerate 30 minutes to 1 hour. Step 2 Alternatively, the dough can be made by hand. Combine the flour with the salt in a large bowl. Cut the butter into 1-inch chunks and add them to the flour, using a fork, a pastry blender or your hands to break up the butter into the flour so the mixture resembles coarse meal. Combine the vinegar and egg yolk in a measuring cup and add enough ice water to bring the volume to one-half cup. Drizzle the liquid, a few tablespoons at a time, over the mixture and stir with a fork until the flour looks crumbly and damp. Again, you may not use all of the liquid. Combine the dough with your hands to form a single ball. Divide the dough in half and cover each half in plastic wrap. Refrigerate 30 minutes to 1 hour. In Recipes-list.com we have selected the most viewed recipes from category - Desserts . Enjoy the best recipes specially selected for you! 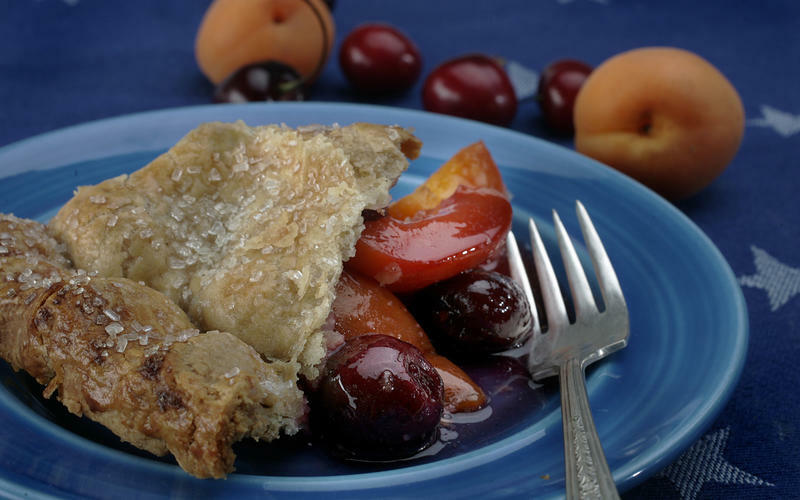 Apricot-cherry pie is the right choice that will satisfy all your claims.